Addiction Recovery for a Lifetime, a Web site sponsored by Narconon Arrowhead, allows visitors to download free addiction help booklet to offer solutions to those struggling with substance abuse issues. MCALESTER, Okla., Oct. 15 /PRNewswire/ -- A residential drug rehab program, Narconon Arrowhead, has just set up a new Web site designed to allow anyone who goes to the site to download a free addiction recovery book entitled "Addiction Recovery for a Lifetime." The book is designed to point anyone in the right direction regarding choosing a drug rehab center, how to get someone into treatment as well as the full components of addiction and how it is handled. "The site is a resource that will supply visitors with a free booklet designed to point addicts and families alike in the right direction when it comes to choosing an addiction treatment center," says Derry Hallmark, CCDC and Senior Director for Expansion for Narconon Arrowhead. Narconon Arrowhead, one of the largest and most successful drug rehab programs in the world, has been helping people permanently overcome addiction problems since opening the doors of their first facility in 1990. The group expanded into one of the largest drug treatment facilities in the nation in 2001 and has saved thousands of lives from the ravages of addiction. Narconon also actively participates in many community events and provides free drug prevention lectures to nearly 50,000 schools, communities and church groups every year. Recent statistics indicate that over 23 million people in the United States are addicted to drugs. In addition over 10 million people are abusing prescription medications. Addiction help is needed now more than ever. If you or a loved one is suffering with a substance abuse problem log ontowww.addictionrecoveryforalifetime.com to download a free copy of the "Addiction Recovery for a Lifetime" booklet. For immediate help contact Narconon Arrowhead today at 1-800-468-6933 to receive an assessment with a Certified Chemical Dependency Counselor. Counselors are available 7 days a week. 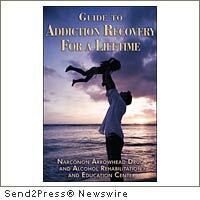 Image Caption: Free drug addiction help booklet provided by Narconon Arrowhead drug rehab.